I watched Julia and Julie on VCD a couple of days ago. I know, the show is not new anymore. My sister had lent it to me and it had been sitting around for a few weeks until the fateful day 10 August. In the story, Julie first started her blog on 13 August, *gasp* which is the day I actually wrote this post (but did not publish it)! While I was watching, my blog giveway was going on and I was thinking of what pie to make...and then Julia Child came on screen, talking about a chocolate pie! Oh man, how coincidental! Now, chocolate pie it shall be! As the story unfolded, I felt like a little like Julie Powell. Like when I started my blog, I wondered whether there are anyone actually reading it, though I didn't start a blog with the intention of having the world read it. Perhaps my sister. Or my mother. But that doesn't count. Only strangers count (like Julie thought so too). Who am I blogging for? No one in particular. I enjoy writing, to put those conversations I have with myself into words. I shall do that as long as I feel like it. When I got my first comment from a complete stranger, the feeling was quite beyond words. Ok, maybe a little exaggerated, but I was ecstatic! That same feeling came last year, when I received my first order from a complete stranger. Moments like this feel so good. I saw Julia Child's book at the bookstore yesterday. If it was about baking, I might have bought it. Perhaps someday, if my interest in French cuisine deepens (and I know how to pronounce the names of the dishes properly), I would. Right now, french cuisine to me is almost limited to crème brûlée, choux à la crème and a few others. There is a kind of elegance and sophistication about French desserts that make me shy away from trying to make them at home. Having said that, I tried a new thing lately. Baked cheesecake. 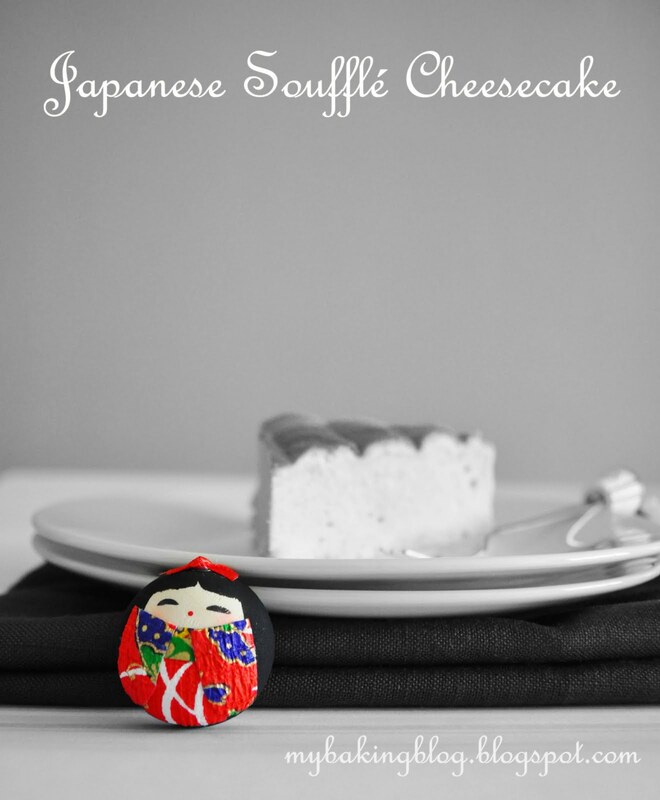 Cheesecake have never been my favourite, until I tried Oreo cheesecake and light japanese cheesecakes. 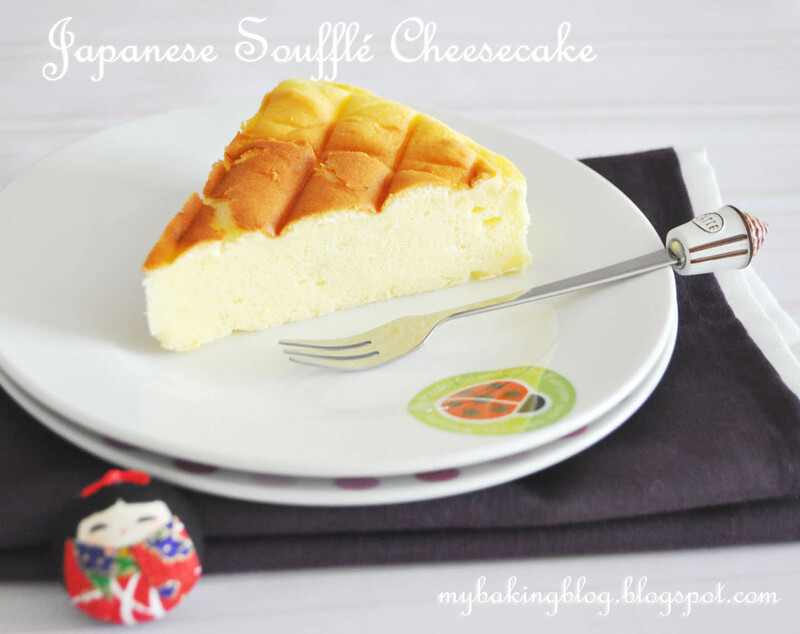 So this time, I decided to take the plunge and try making a Japanese Souffle Cheesecake. It is the first time I use a springform pan and definitely the first time I bake with the water bath method. The cake came out with a lot of cracks on the surface, guess I needed more control over the temperature. I made it look worse by inverting it on my cooling rack and added grid lines to its face (remember, don't do this like me!). But it tasted good. Light and fluffy like a souffle should. The cheese was not overpowering nor heavy. It is a perfect accompaniment for afternoon teas. Perfect for those times when you mouth feels like eating something but your stomach doesn't really agree. Try the recipe here, I'm sure you can make it nicer than me. Looks so good! I'm definitely going to make this!